Photos taken on May 16, 2005. 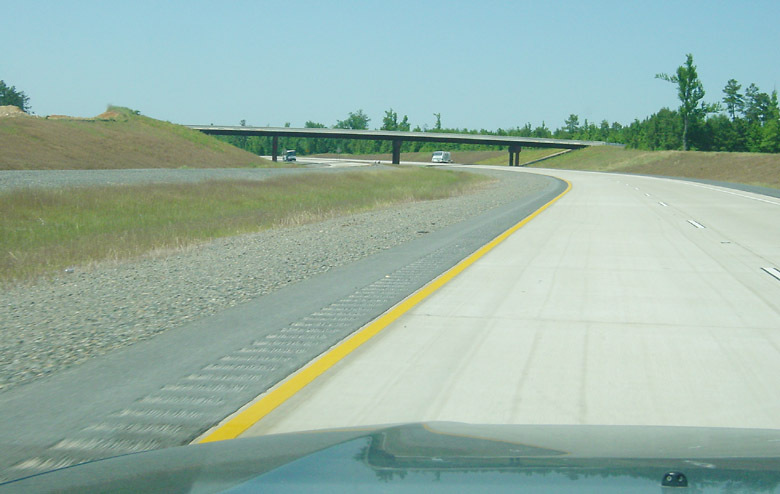 Photos start near the Louisiana-Arkansas border and proceed northward along the US 71/AR 549 (future Interstate 49) corridor to Texarkana. 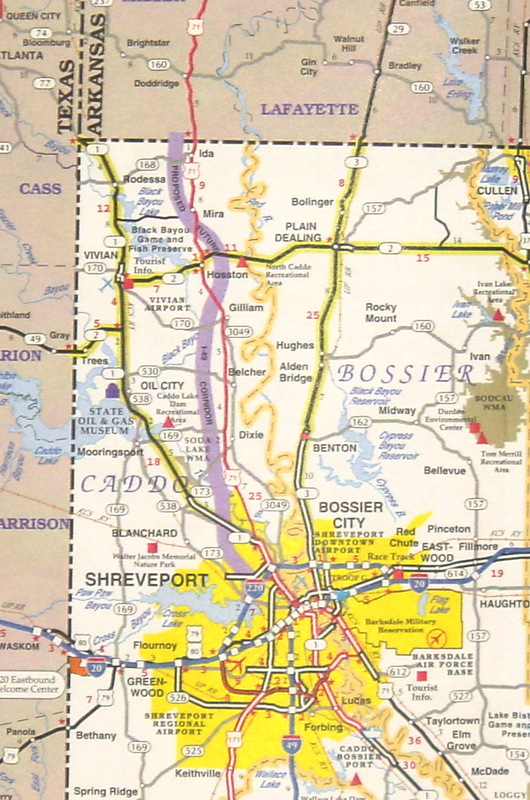 We then Looped around Texarkana using US 59 and returned to State Line Road on the border. 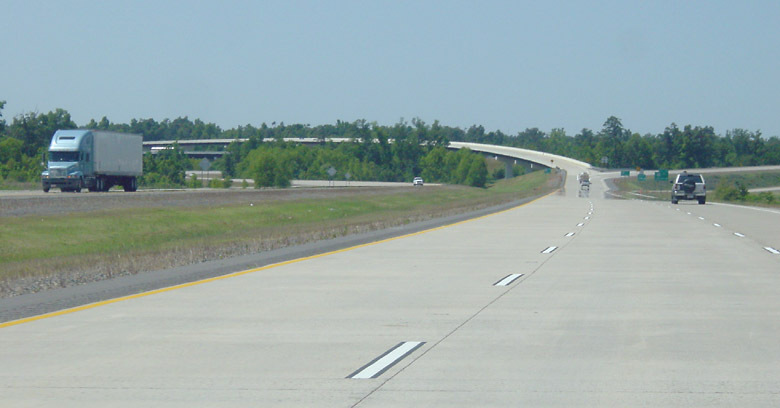 We found no signs of work on Interstate 49 in Louisiana north of Shreveport to the Arkansas border. There have been reports of clearing and grubbing for the future corridor, but we didn't find it. 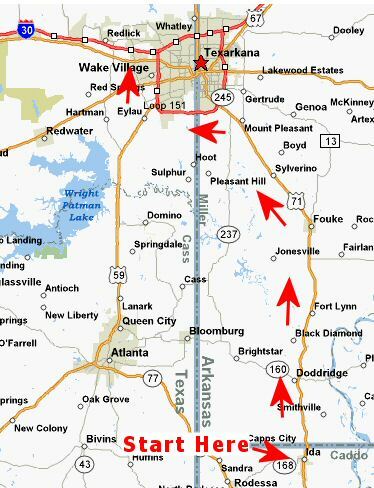 There are plenty of signs "Future Corridor I-49" all along the corridor wherever a future intersection will exist. The story is much different in Arkansas. 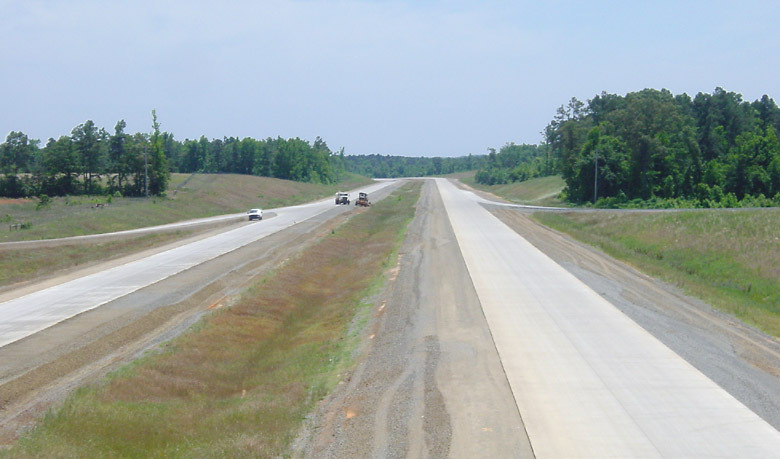 Just north of the Louisiana border construction is in progress and nearly complete on a long section. Further north, the facility is open and signed as AR 549. It is definitely a nice rural interstate, although not yet officially signed as as interstate. 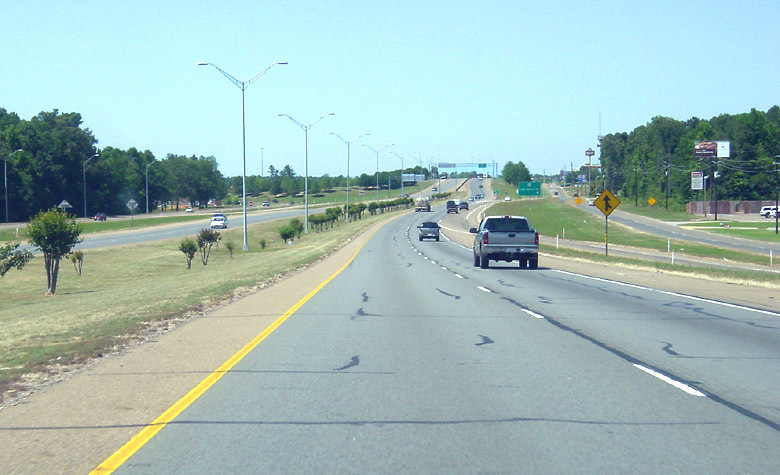 The official alignment of I-49 takes it on the east side of Texarkana using AR 245, which is currently mostly freeway standard but has at least one at-grade intersection. 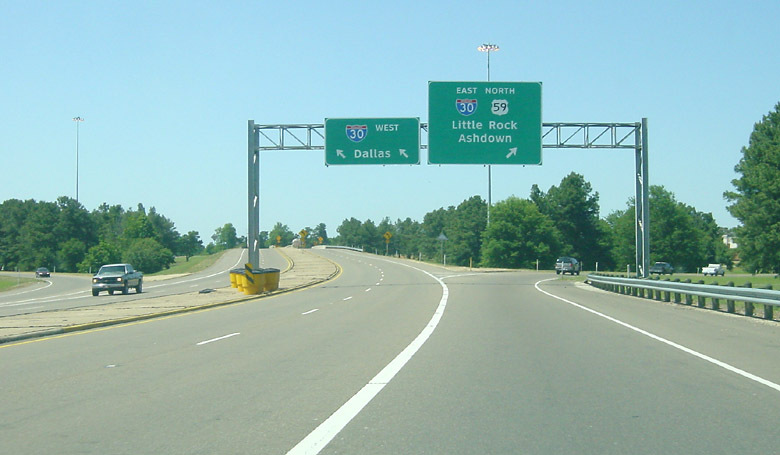 Taking AR 245 westbound takes you to the Texas border after a mile or two. 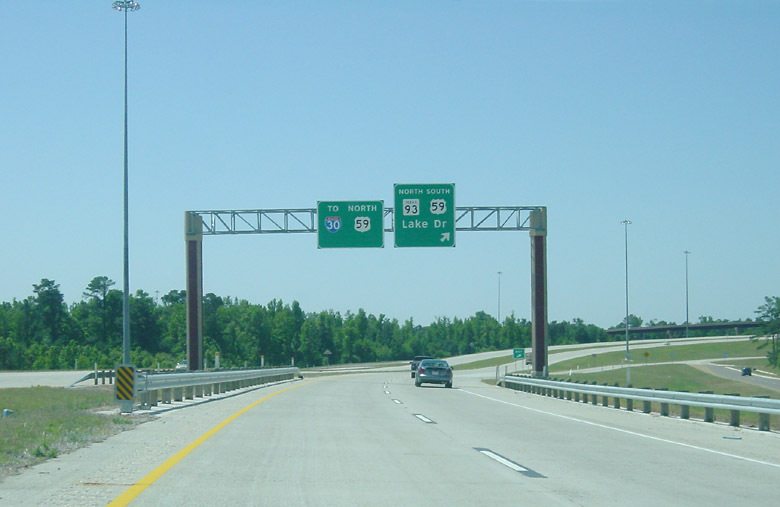 The freeway continues in Texas as Loop 151, and then the freeway merges in with the US 59 freeway, which continues to Interstate 30. 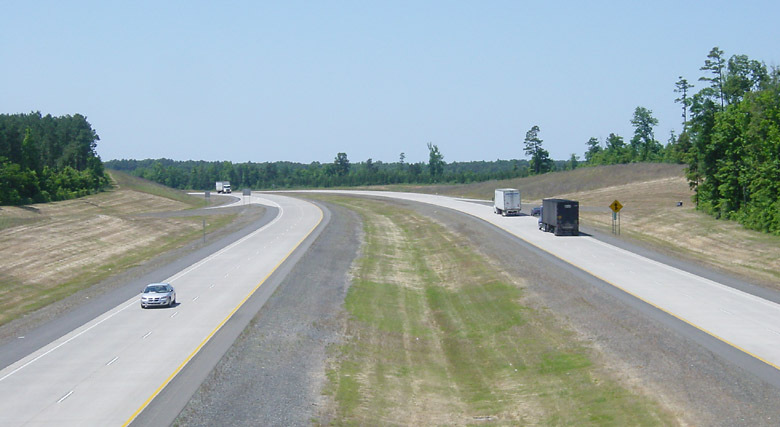 I must say, it is embarrassing to see a lower-income state like Arkansas making good progress on their rural interstates, while our Texas politicians just plan to toll us into oblivion. 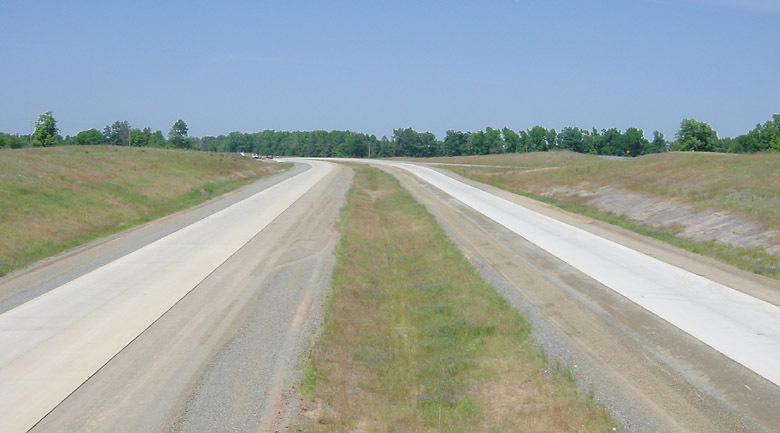 This view shows the planned alignment of I-49 in Louisiana north of Shreveport. Signs indicating the future corridor abound, but we found no signs of work in progress. Traffic on US 71 was very light on the Monday afteroon. Future corridor sign along LA 168. A closer view of the future corridor sign. Proceeding northbound, we enter Arkansas. 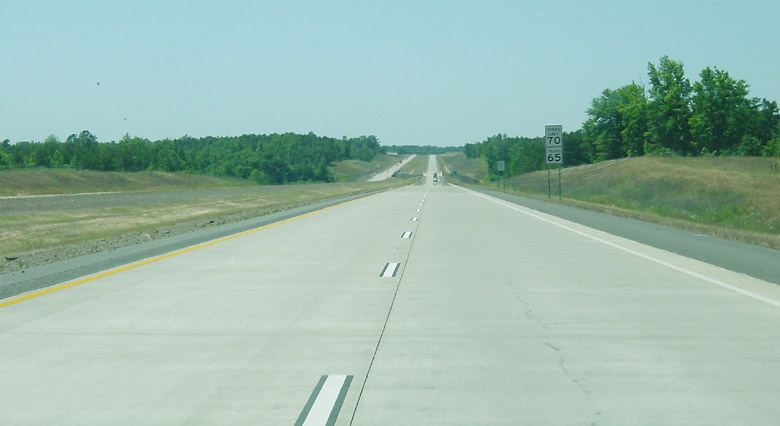 Just north of the border we reach the construction zone for AR 549/future I-49. 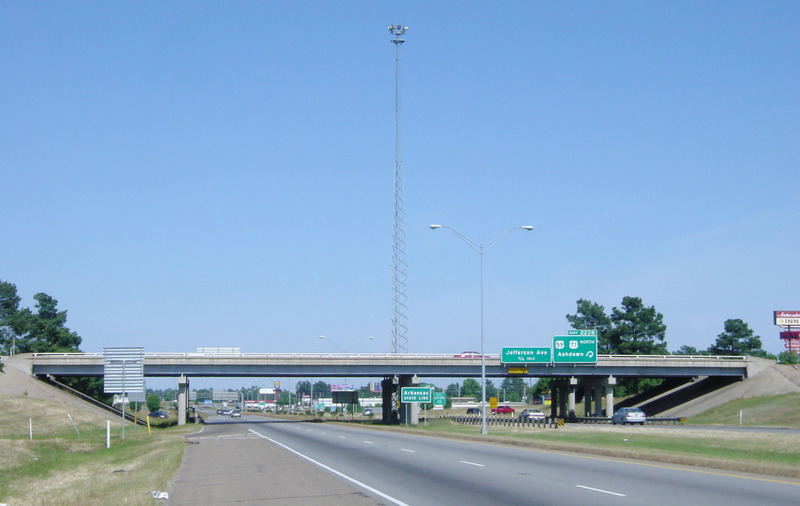 The interstate terminates at US 71 right here, with exit ramps under construction. Eventually it will be extended south, of course. 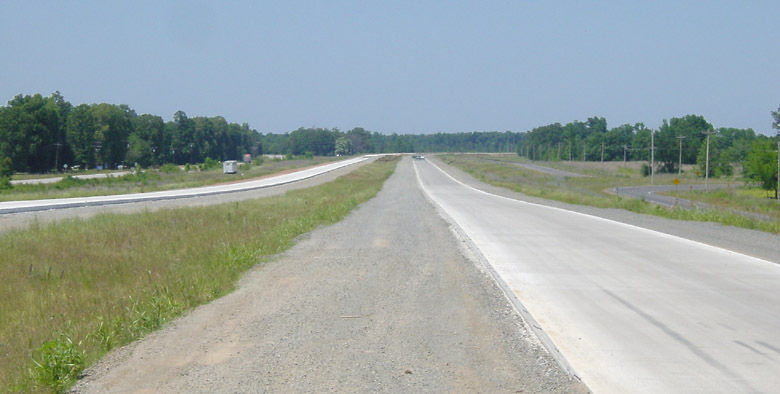 Here is a view of the nearly-complete interstate, looking north from County Road 197. This view looks south from County Road 197. Just north of County Road 197 the Interstate runs parallel with US 71. I find these kinds of views quite interesting, with the new interstate visible from the old road. In the 1960s this type of scene was commonplace all over the country, but now it is a very rare event. For Gen-Xers like me, it is definitely a treat to get this kind of a flashback. Here the interstate crosses County Road 8. There is no interchange. Looking north from the County Road 8 overpass, with pavement ready and awaiting markings. Proceeding north on US 71, we reach the point where we can enter the complete interstate main lanes, visible just ahead. 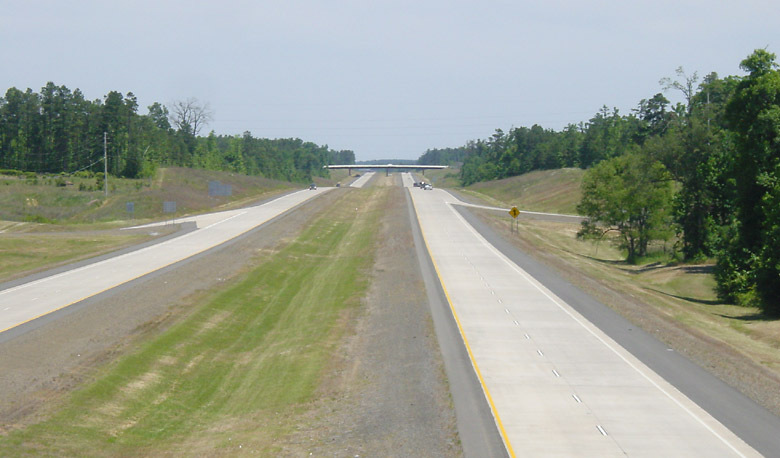 The interstate is open to the left, under construction to the right. The vehicles on the overpass are construction worker vehicles. Here is the signage at the overpass. 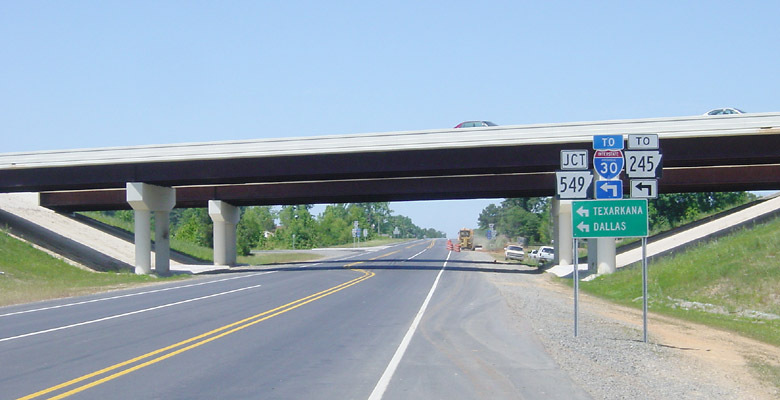 The future Interstate 49 is Arkansas 549, and further north in Texarkana I-49 will follow AR 245. 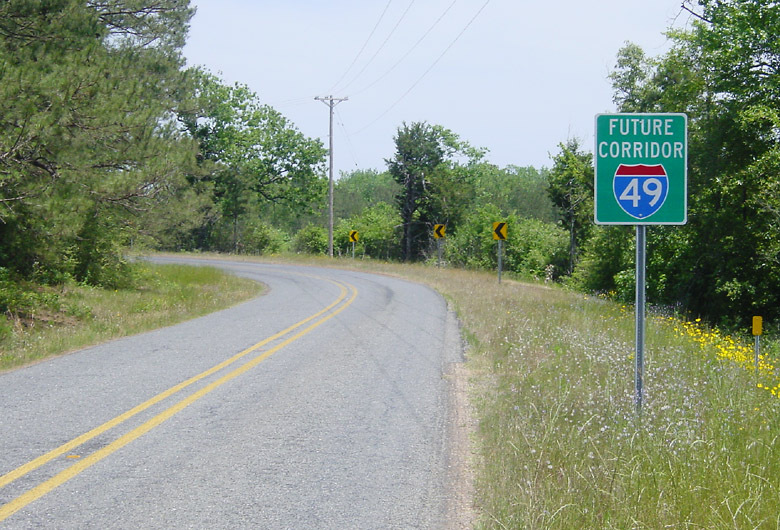 It seems strange that Lousiana plasters "future corridor I-49" signs all over the place, whereas Arkansas actually has the facility and doesn't make any mention that this is the future I-49. 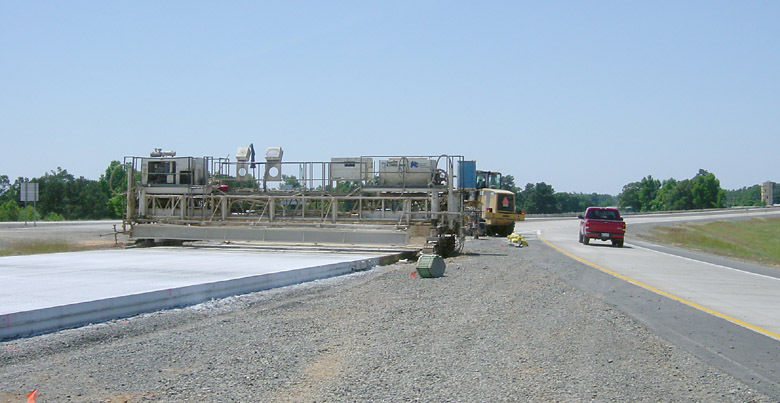 At the on-ramp, a paving machine has just laid the northbound main lane concrete. 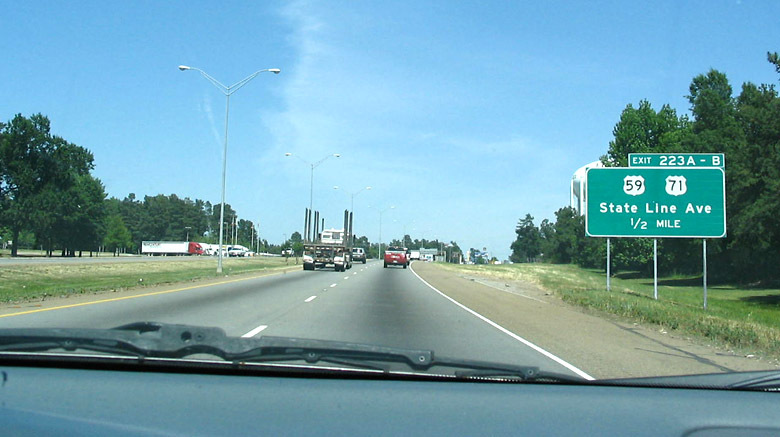 A driver's view going northbound on AR 549. Looking southbound from an overcrossing. Looking northbound from the same overcrossing. 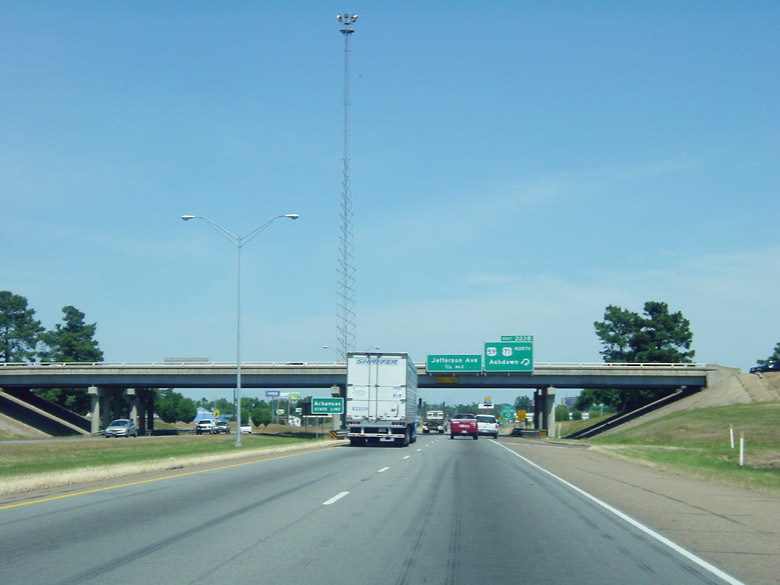 Approaching Texarkana, the interchange with AR 245 is just ahead. 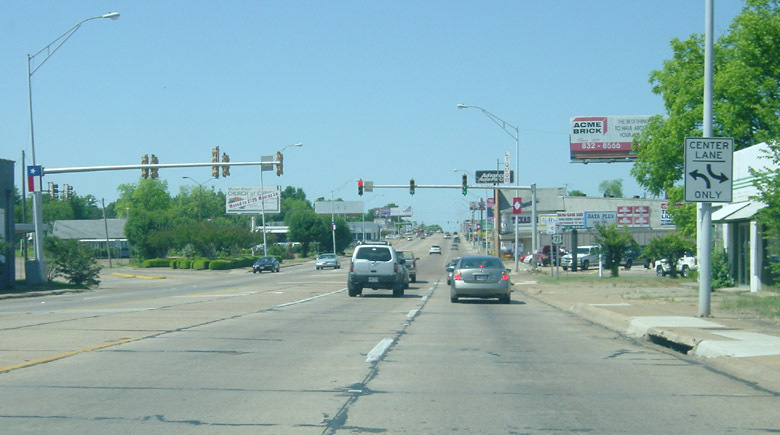 AR 245 is the Arkansas portion of the Texarkana loop. 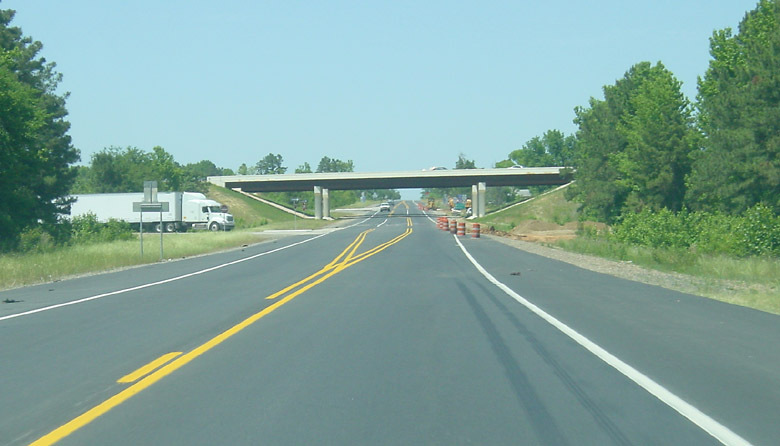 The I-49 alignment will follow AR 245 northbound, to our right. 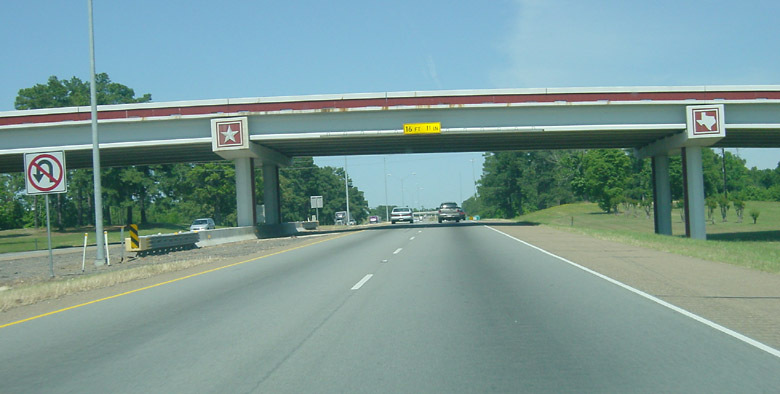 We will follow the ramp going left to AR 245 westbound, which turns into Loop 151 in Texas, which is just ahead. Loop 151 in Texas is a nice, relatively new freeway. Here is where it approaches its end at US 59. Notice the abundant high mast lights: you are now in Texas. This is the interchange at US 59. Barely visible is this view due to bad exposure is the third-level ramp bringing in the traffic from US 59. 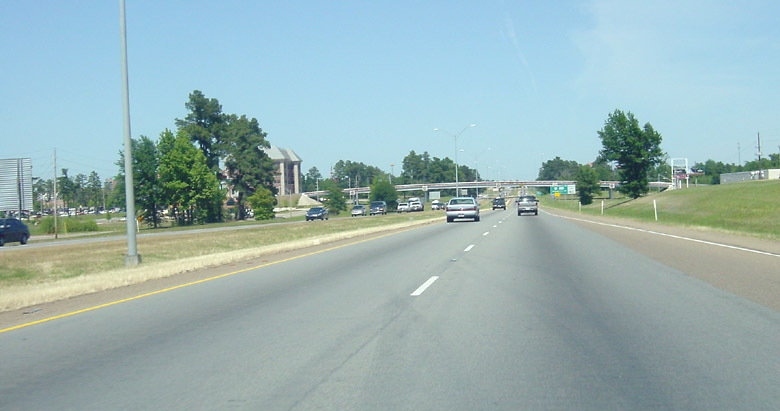 This is the US 59 freeway on the west side of Texarkana. It is a full freeway without interruption. 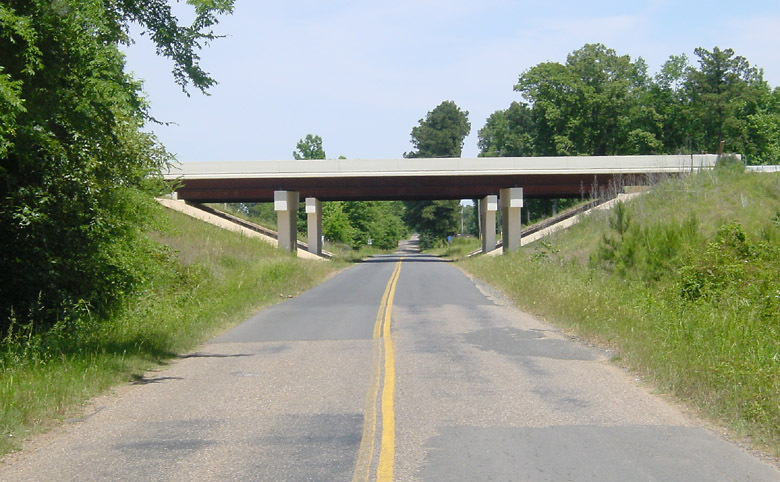 This is the terminus of the US 59 freeway at I-30. 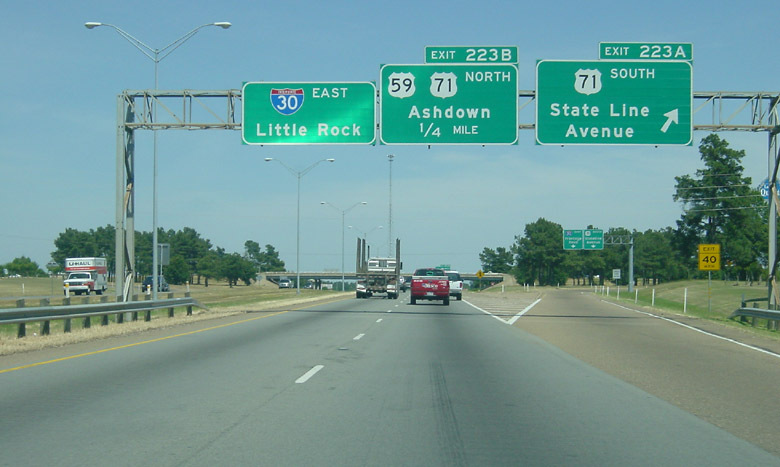 US 59 briefly follows I-30 into Arkansas. 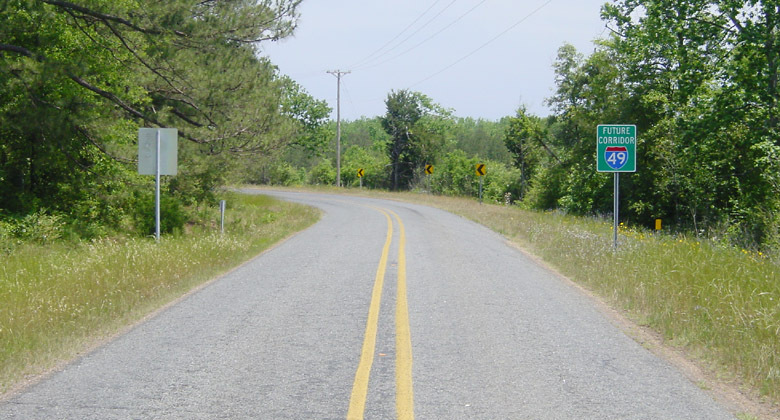 The Texas-Arkansas border is at State Line Road, which (as the name suggests) is on the state line. Approaching the State Line road exit. This is Interstate 30 eastbound at the state line. Notice the tall truss tower illumination. This was one of the first high-lighting installations in the state of Texas and United States when it was installed in 1968. Some smaller truss towers were also installed in San Antonio on I-10 that year, but those were shorter. The first true high mast lighting tower was installed in Interstate 5 in Auburn, Washington, earlier in 1968. (Click for high resolution) Here is another view of the state line, from the north side of I-30. This is State Line Road south of I-30, going northbound. Texas is on the left, Arkansas is on the right. 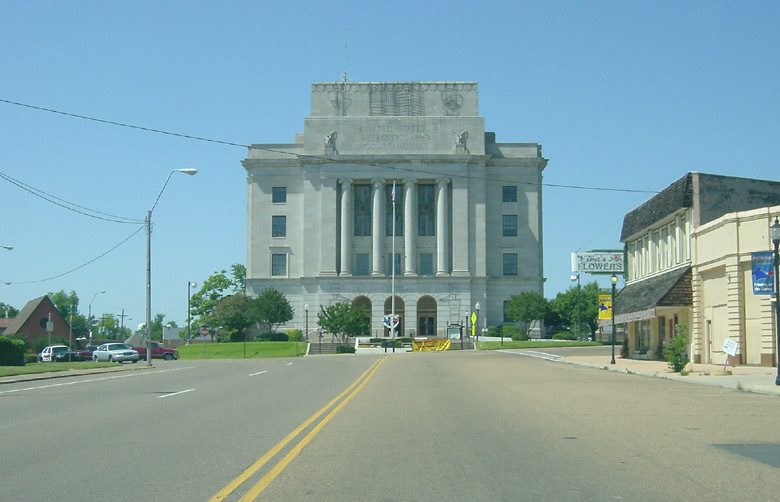 Further south, the courthouse/post office is on the state border in the middle of the road. 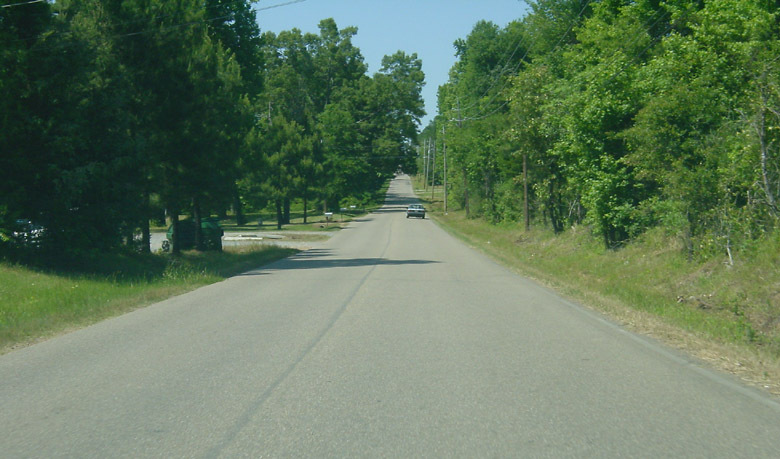 South of town, this view is northbound on State Line Road. Texas is on the left, Arkansas is on the right.